Tiburon is an addict of “phoco,” a hideous sounding mixture of cocaine, rat poison and dust from the hills surrounding Tijuana. 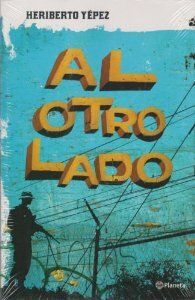 The desolate life he leads is populated by criminals, corrupt police and travelers waiting for their chance to cross the border to the other side – el otro lado. Tiburon finally decides to make something of himself, and act independently, but it’s not certain that he has the nerve for the criminal life he chooses. A wonderful book that shows a side of Tijuana that we have never quite imagined.